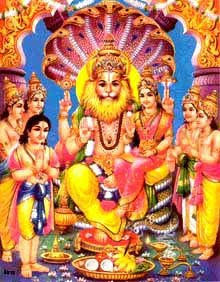 Narasimha Avatar is the Half-Man Half-Lion Incarnation of Sri Hari Vishnu. The story of Narasimha Avatar is associated with Vishnu’s incarnation as the boar or Varaha. To uphold dharma and save the Vedas, Varaha had killed the brother of demon Hiranyakashipu. To avenge his brother’s death, Hiranyakashipu performed intense austerities and was able to please God Brahma. When Brahma appeared before him he asked for immortality. But Brahma said he could not grant him the boon of immortality. So Hiranyakashipu played a trick on Brahma and asked a series of boons all of which indirectly tried to avoid death. He will not die in any type of residence or outside. He will not die during day or night. After earning the boons, Hiranyakashipu defeated demigods and rulers on earth and announced that he was God and all prayers should be directed to him and not to Vishnu. The entire kingdom followed his commands but not his young son, Prahlad. The little boy Prahlad worshipped Srihari Vishnu. Hiranyakashipu tried all means to make the boy worship Him. But all this efforts failed. Then the demon tried to kill his son but each time the little boy was rescued by Vishnu. Fed up with his son’s Vishnu worship, Hiranyakashipu demanded to him to show him his Vishnu who is present everywhere. In a fit of anger pointing to a pillar, Hiranyakashipu asked whether Vishnu is present in it. Young Prahlad said yes and Hiranyakashipu took out his sword to cut the pillar. Suddenly, Narasimha broke open the pillar and appeared before Hiranyakashipu. Narasimha then dragged him to the doorway of the palace and when the twilight period approached put him in His lap and killed him with His finger nails. Thus the boons failed to protect Hiranyakashipu.